I believe everyone is responsible for this from the government to the people because of greed of "wanting more" and as usual nobody cares about the consequence/after effects. When the greed reaches a melting point, its then we realize that "We made a mistake rather we know what we were doing was a mistake". Look at India itself, the government has failed to curb the raising inflation and guess what nobody seems to be bothered on why they end up paying higher prices for food. No one is raising the questions and the price effect can be seen on other items too as the price raises. There are no voices been raised on this!! The corruption scams that's been coming out is also on the same lines. As long as media pursues it, these cases will stay in limelight, once they stop it, it will fade away from people's memories. No one person is responsible for the current appalling state of the world. Barack Obama is merely a man on whose shoulders the world, in a moment of collective euphoria, unreasonably put the weight of its increasingly desperate dreams and aspirations. I shudder to think what my daughters and grandchildren will have to contend with in the future, such is the state of this poor speck of cosmic dust we live on. 2011 is already becoming a year of massive global uprisings against established powers. More, much more, will come. Things will have to change. This week, it shocked me profoundly to hear a professor from India say on BBC radio 4 that India has more than enough food to feed its famished poor and that if it chooses not to do so it's only because of political and economical pressures. It's absurd. Everything has become the oposite of what common sense. Common sense has become common nonsense. I picked some onions from my vegie patch today - now I have 15 onions. Wouldn't it be wonderful if it was as simple as sharing these onions with the lady who has none? The world is such a complex place. impacts on a poor farmer in a country thousands of miles away. You are really slamming the poor old Americans. It's not fair to tar them all with the same brush. Every country is the same. People are the same all the world over. I'm sorry you feel so angry and helpless. Sometimes the problems of the world are overwhelming and sensitive people can let too much of the world's pain creep into their souls. Be careful it doesn't swallow you whole. "Have you learned the lessons only of those who admired you, and were tender with you, and stood aside for you? Have you not learned great lessons from those who braced themselves against you, and disputed passage with you? " "I accept reality and dare not question it." "I am as bad as the worst, but, thank God, I am as good as the best." "Judging from the main portions of the history of the world, so far, justice is always in jeopardy." "Let that which stood in front go behind, let that which was behind advance to the front, let bigots, fools, unclean persons, offer new propositions, let the old propositions be postponed." So, I will post a link to your post at my fb page. Although, not before sharing that, despite all the glossy colour magazines and propaganda, the majority of the population are feeling very much the downturn of the economy. The poor and, vanishing middle/hard working class are seriously affected here too. And trust me, there is serious poverty in this continent also. The farmers in North America have become hostage of the Monsanto, McDonald's and the like... thus, changing the very way we live. The "machinery in motion" is soooooo huge that I can't fathom how (?) where (?) to begin reversing this forward momentum. From this vantage point, he might as well be bound and gagged, his position is decidedly (almost) impossible. We are living through a process whereby the US is shifting its role as a leader nation to that of "one of the crowd" - it can no longer act as such, therefore be expected to lead - as it has been mostly a "bravado" leadership that took into little account global needs. No, YOGESH, How can i blame the present state of affairs on one person when they were prevalent for thousands of years. Ever since God, religion, saints, prophets were manufactured, there has been no peace in the world. Main agenda for creating God was to control the society and the side agenda was always to protect the rich. Poverty was designed and created by religion. And Greed is one of the primary instinct of humans. One Obama or thousand Obamas can't cure the disease. i am blaming President Obama for letting the oil price hike without batting an eyelid which resulted in further inflation all over the world. He could have stopped it. Major oil revenue comes from the highest consumer of oil, that is USA. Third world countries get crushed under the inflation. Greedy Indian politicians have sold the country to the corporates. India can feed twice the number of population easily as there has never been food shortage here. We have surplus of food, still millions go hungry every night and farmers continue to commit suicide. This is very strange. i have covered the topic in my environment series a couple of years ago. Making people aware of the root causes of present maladies is what i am doing Yogesh. We have to talk about it first. You see the whole picture CLAUDIA, which many wise and intelligent can't. You are educated and talented, you have created options for yourself. You know extra money has to come from somewhere to make the ends meet. So you work, sacrificing your desires, leisure relaxation and entertainment. Hope children don't forget your sacrifices when they grow up. This has happened to me, though i have no children of my own. The smiling lady knitting a sweater is not that lucky, she has no options, she faces starvation even if she puts in more working hours. She and her family gets crushed under the inflation. My friends here still believe that nothing is wrong with the world and everything is going fine. They are not aware in which direction the world is going. i was very skeptical when President Obama was elected and awarded a Nobel Prize. This was going like creating a cult and creating a myth. i suspected this cult fever would take us in a wrong direction. And it has. Ending the war has not happened, it has escalated in fact, soldiers were not brought home as promised. More soldiers were sent to Afghanistan. PATRIOT act is implemented more viciously. American citizens have lost their privacy. 'an inconvenient truth' has become a 'convenient lie' making room for more carbon taxes. Still people think that things are hunky-dory. Very strange indeed Claudia. Your worries are quite valid. Yes CLAUDIA, it is quite shocking. Food is surplus in India from past couple of decades and yet millions go hungry every night. This is deep rooted. More than political this is a social issue. I discussed this topic in my environment series. Poverty was designed in India thousands of years ago. Society was religiously and very cleverly divided in to 4 different cast. The lowest cast people are born into misery. they have no right to dream. They have no hopes. Their misery is religious. They religiously suffer in hopes of being reborn into a higher cast. Very clever of the ruling elite. They work in farms but die of starvation with all the surplus food in stock. Besides, a great quantity of grain is damaged due to poor storage and pests. World is not a complex place Letty girl, we the humans are complex, life is simple we have made it complicated. The animals are fine, what ever problems they have are caused by us. There are exceptions everywhere Lettys. i had figures which i can't locate now. More than 1400 Nobel prizes have gone to US citizens, the highest for any country. US has best of universities best of philosophers professors economists, scientists and yet they let the country get hijacked by a few greedy maniacs who took the country to unjustified and illegal wars and drown the country into a financial mess. Good prevails over evil, but evil is more powerful Lettys. history shows that Good never destroyed evil. Evil was destroyed by bigger evil. i have to generalise when what ever happens within the most powerful country affects us all, good or bad. Prices are hiked for the highest consumers which affects rest of the world. Enjoy the Onions Letty girl. They are very expensive here now. Thanks for the quotes RUTH, as usual i don't understand most of them. Some are beyond my understanding. i don't know why you removed the comments you posted. I removed the first brief comment, which said I would come back later. I said in it, "I agree," but in some ways I don't agree with you, so I took it off. Below is the second comment I removed, rauf. I admit that I feel quite helpless. Always this is how I feel. I understand that you sit and feel frustrated. I think this comes, it can't help but come, if we sit and focus on nothing but these terrible realities. I don't know what it is accomplishing, for you to tear yourself apart, rauf. I don't know. And that's why I took my comments off and just left Whitman's words. I just feel helpless, as you do. But I am not selfless like you, and I don't want it to tear me apart. And really, I don't think tearing myself apart would accomplish anything. But a few realities. A country is born. High ideals and expectations. Even a few dozen delegates at the Continental Congress could hardly agree on decisions for forming the country of thirteen colonies. The country started on shaky footing. And so most countries do. Their history begins, decisions are made, and for days, months, years, decades and centuries, all the decisions and huge mistakes become like masses of immovable land. To change the landscape takes bigger bulldozers than anyone has. Change, like human rights, comes slowly and at great human cost. Still today, how many decades since the abolishment of slavery, still we have terrible race relations in the U.S.
A person is born, sort of clean, sort of like a clean slate. But even a baby is born with great conflict inside. Parents' genes, imprinting, needs. The child grows and gets shaped by society, makes decisions, makes mistakes. Through life sometimes the child grows up to be a person who learns and starts to try to undo the personal mistakes, and even try to stand up to the huge mistakes of the country. This person tries to live, daily, with integrity, authenticity. But there is shame, deep shame because of identifying with oneself and previous mistakes, with the parents' and their mistakes, and the country and its great mistakes. The person tries, with a vote to make a difference. Tries by sending letters to senators and congressmen to make a difference. Tries by joining causes, marching, protesting. But still the land masses go unchanged, and so many in the world suffer, because of a few people, and a few companies, and a few countries. 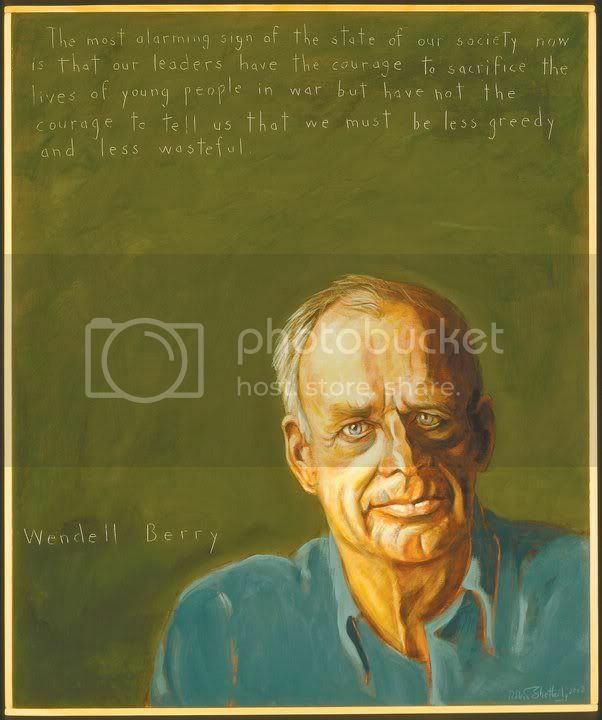 A person like Wendell Berry managed somehow to learn very early to make the right decisions. He does not own a computer. He farms his land with a horse-drawn plow. He has a great influence on people like me. But still, I own a computer. I buy the wrong things. I fly in airplanes because the train is more expensive and I have made big mistakes and my available cash is limited. I have to work hard, and I can't take time off to take a train. I live with my mistakes, but my heart wants everything to change. Not every American is ignorant. But perhaps every American is guilty of the mistakes, because we have created this along with our government, by just existing. It is insensitive of me to say I don't know what your deep frustration, anger and heartbreak are accomplishing, rauf. I'm sorry. I know that is not the point. People will go on suffering, regardless of how we feel. It's terrible. First of all what is Obama. President Obama appeared on the horizon like a ray of hope which lit the world. i have not seen in my adult life such world wide euphoria over the election result in any single country. This was world wide, not in any single country. People in Europe, Asia, Africa Australia and the Americas were so frustrated with their own leaders that they saw hope in a young dynamic and charismatic leader of the most powerful country in the world. He became not just a President of USA but he became the President of the world. I can tell you Alicia, a huge opportunity was missed here to control the world. Then came the Nobel Prize which was rather puzzling to me. i consider this strange award was thrust on him to make him understand his responsibility to the people of the world and not just the people of United States. i would like to know your views on this subject Alicia. Before writing this post which i kept delaying, i knew very well that i would be running in to Obama admirers supporters and fans. i knew very well that i would be annoying them. Faith religion ideology blunts our reason, i would like to add love and adoration to the list. My friends here in Chennai are refusing to see beyond the facade. As a world leader there have been no significant achievement in two years. No proposals, no future plans are forth coming for world peace or to bring any relief to the suffering. The middle class is not disappearing Alicia, they are joining the poor class. The gap between the rich and the poor is now considered as a 8th wonder. i understand this is a monumental task and it will take years for any plans to materialise. But unfortunately no steps have been taken so far. Least he could have done was to curb the inflation which was in his power. He simply ignored the oil price hike. This made me suspect his intentions. i was already skeptical the day he took office, i just hoped that i was wrong Alicia. He failed to curb the corporate control, there is no mention of it. rauf - I dunno - I don't think people in Australia looked to Obama as the world's saviour. We are very sceptical, suspicious people in Australia but at the same time very open and friendly. We don't like "tall poppies". I think we just expect people to be decent. I remember thinking the people of the US were headed for a fall. Poor old Obama had way too much expectation resting on his shoulders. After all, he is just a man. I think that is an interesting thought about giving obama the Nobel prize to give him something to aspire to - I hadn't looked at it that way. I must admit Vince and I both thought at the time it was weird he received the Nobel prize - what did he do?? Don't get so down that you want to kill yourself, okay? Yes, the world is full of really awful stuff. But it is also full of beautiful stuff. Letting the bad stuff cripple you wont just hurt yourself, it achieves nothing and it won't help to change a thing. I'm sorry you have (temporarily) lost you love for music. Here's a snappy little tune that has captured my imagination lately. And I only recently came across that Katie Melua song - it's beautiful. I put it on my most recent "mixed tape". Very emotional post Rauf. Sad indeed…the state of the world. I agree and relate to the frustrations you feel but I cannot entirely agree to all the blames you have laid. I mean I would be in front of the line pointing finger at large corporates and crazy dictators/politicians and all the manipulations they do and allowing myself to be manipulated..but Obama!? Why are we making him a scapegoat!? I actually feel bad for that man. He took over a position that did not promise to be in anyway a smooth ride, and you are right; practically the whole world saw him as a “symbol of hope”. But if the people wanted a miracle out of him, then the people are plain stupid. I don’t think he is a miracle maker and I think he is sincerely trying, despite the pressures, the hurdles and the criticisms. Then there is the “American society”, another favorite to dump all the blame on. I think we should be a little more sensitive than that. I have come across many Americans who are very aware of what is going on and doing their best to improve or make a difference. Since I am here as a student and my stipend barely allows me to make it through the month I am not yet blinded by any luxuries that America can offer. So I think I make a fair assessment when I say I have seen students (who are Americans), doing their best to fix things. Take the case of buying food. It is comparatively expensive to buy fresh local food from farmers’ market and coops, or to buy organic food and giving up corporate manufactured food; yet, I know many who use their limited money just for that. Not because they can afford it but because they feel it is the right thing to do. They rather eat less than buy “cheap junk” and support companies that deliver it. Or, they could use up their free time to party and have fun....yet they volunteer their time for environmental clean ups and other worthy causes. I was in a class once and we took a poll and found that majority in the class either ride their cycles to school or use the public transport or car pool. In another class students talked about the carbon footprint they reduced by flying less every year. I know young people who buy old cars, modify the engines to make it run on used vegetable oil…and many more such examples. Not just students, I know many professors and others who hold proper jobs and can actually afford many luxuries but make conscientious choices. Now, in terms of scale each of these efforts may not make an immediate, significant difference..but summed up, over time, it will. I agree with what freefalling said about countries being the same, people being the same…so blame “us” not “them”. Even if Obama implements a policy tomorrow that everyone use only public transport and not private vehicles you think it is going to work? I think that decision to change should come from all of us. I guess I just want to remain hopeful. RUTH, i fully understand what you say and completely agree with you. There is absolutely no point in getting frustrated and depressed over things i can do nothing about. First, i have changed my way of life, brought it down to bare minimum. i live with basic comforts and train myself to live without them when i go to live in the forests for short period of time away from technology and travel with minimum comforts. When i observe animal life i realise how wrong we are. How we have drifted and completely moved away from nature. My frustrations need not accomplish anything Ruth, they just keep me aware and make me think with clarity. Life itself is a cage and we live in cages within cages of our own making like pride, image, social status, possessions, money greed, religion, philosophies, comforts, technology. When we choose to live in a society we accept and agree to live in a cage or cages. A crow does not own anything. Ownership causes various problems, we begin to worry about losing what we own. i connect all my actions and thoughts to an animal. Every second. That is my major problem. i realise how wrong i am. i realise how all philosophies are completely useless to me. i'll continue in the next comment Ruth as google sometimes doesn't accept long comments and the whole thing gets lost. like 'He is eating mud to marry her'. Meaning he is trying all methods legal illegal pleasant unpleasant to marry her. This is what i observe in humans Ruth. We eat mud to be in a cage of comforts. We don't have to. Very few out of the lot are smart. They use the rest to work for them. This is how we have been cheated for thousands of years. This is how poverty and suffering were created by creating God, creating stories and religions to control the common people. Though the earth can feed twice the number of lives living on the planet. As i am typing this i received a spam message on my mobile. Wonder why is he doing that. He wants more Ruth. He is not happy with what he has got. Greed gives room for insecurity. He is afraid. For me this is very funny. What gives him the right to send me a spam message ? There is some one protecting and encouraging his greed Ruth. i have accused President Obama for protecting him. Same thing happens in a bigger picture. Only the players are big. greed is big. Affected people are you and me Ruth and the millions of poor people all over the world. The greedy can be stopped by a most powerful person in the world. But unfortunately he is not doing it. i am not accusing him for not repairing the damage. This is a very long process. It will take hundreds of Obamas to do it as the damage is thousands of years old. After a break, coffee and a smoke of Michigan tobacco. So, it will take hundreds of Obamas to repair the damage RUTH, if we are lucky to have them in the future. You know what happened to President Kennedy who had his 'own' ideas. In between we had only puppets or stooges as Presidents until President Obama came. Naturally the expectations of the people are very high. i ask myself who else. No one, not one leader of any country matches his power, charm and charisma. The Nobel prize committee were not drunk when they chose to bestow an honour on him without any achievement. He was not honoured in expections to rectify the problems of United States alone. This is a monumental task but he has to start somewhere. Now you can understand my frustration Ruth. i live in India. i have a different perspective. i live in a land of extremes. A land of joy, history and traditions, a land of freedom but most of all, a land of misery and suffering, inspite of all the wealth nature has bestowed on us. India is a rich country with abundance of food, yet millions go hungry every night. Gandhi had ideas. Very similar to Wendell Berry. i don't fully agree with both of them as we have to accept technology, which brings prosperity, makes our life easier and educates us. All the elements of energy come from nature and they are free, even nuclear energy. There are costs involved in converting the elements to energy. But this does not explain the inflation unless they are willful. This is a crime in my opinion Ruth. A crime committed by the most greedy and rich in owning the elements. Who can stop this crime Ruth ? The people. We the people can stop. And a man like President Obama can motivate us to stop such a crime. Is he doing it ? Perhaps he will one day. If he is lucky to be left alive. i still have hopes Ruth. oh LETTY GIRL, please don't worry about me. It is difficult to remain sane in this world, specially in a country like India. When i step out i see misery everywhere. i see wastage everywhere. i see madness everywhere. Every one is in a hurry as if the earth is going to move under their feet. i too go mad at times and escape for a while. No total escape is possible as we all are trapped in a cage. But humans find ways to be happy and ways to avoid suffering. Primary instinct is to pursue happiness and i am lacking in that department right now. Observing the stage and the actors is fun Lettys. Being there is not much fun unless one becomes insensitive to the surroundings. Survival is such a pain and the animals tackle it so easily. i observe the animals too and try to be as sensible as them. i have failed miserably Lettys. Yes Australians are very skeptical. Sprots being a major religion in Australia, its not easy to sell them any myth or a philosophy, unless they see it HAPPEN. i watched the youtube video, nice song but some weird visuals. Is it a signature song of a TV serial ? i write on an impulse and regret. i sit and brood, then i delay responding to comments. This is not sensible Lettys. i like being stupid i think. And i know i am not intelligent and i can't understand complications. i take my king and run around on the chess board. How stupid, why a king can't run like the real kings do ? i ask and the queen is having all the fun running around where ever she wants. That is the level of my intelligence Lettys. Do me a favour E2DEES, please tell me the difference between working of Reserve Bank of India and the working of Federal Reserve Bank in simple words. Don't tell me this is not your subject. its too complicated for me to understand. You may find some major causes of our problems there. President Woodrow Wilson regretted signing a document giving a free hand to Federal Reserve i think. I'll write about it e2dees. President Obama can do very little about it. Perhaps the Constitution needs to be changed or amended. No no no, i am not making President Obama a scapegoat. i have God for that purpose. i blame God for the madness of creation. Trillions of Galaxies ? What is wrong with him ? What madness! Silly chap. if everything happened by chance, i have no one to put the blame on e2dees. Lets keep god alive for this purpose. i accuse President Obama for taking no action on oil price hike. It was within his power to stop it. This led to world wide inflation. Farmers were committing suicides even before President Obama came on the scene. i am accusing Obama for letting the Corporates have a free hand. This aiding and abetting a crime. Stopping the criminals or taking some steps against the total corporate control is not a miracle. '63 onwards you had just corporate stooges as presidents e2dees. A few before Kennedy too after ww2. Sad part is that citizens of US are not aware of the dangers of Corporate control. They are not aware which way they are going. What ever happens in the US affects rest of the world e2dees, if we like it or not. i know there are people in the US and more in Europe who individually are changing their lifestyle rejecting the cheap and mass corporate produce. But this is not enough. Take a look at the chart e2dees. 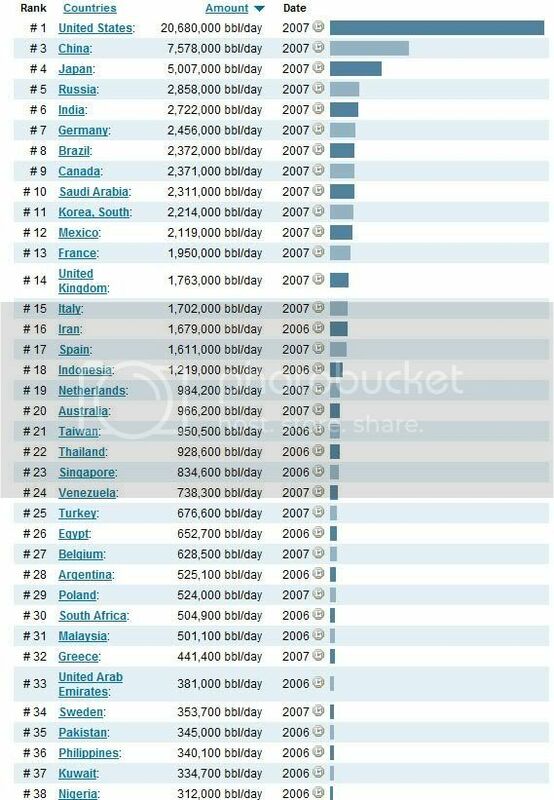 US is the largest consumer of oil. US has only 5% of world population. What does it tell you ? Wastage of resources. This affects the world. You can afford to pay, but i can't. It becomes nearly impossible for me to survive. i am thousands of miles away. I thought it was an Indian word for something I didn't know about! Finally, the penny has dropped. I’m afraid that the world today is not ruled by democratically elected leaders. There are some – too many – dictators around, who may have some influence, mostly negative (concentrating on building up their own personal fortunes). But we are today much more ruled by financial “leaders” than by politicians … and often the politicians are governed by these financial “leaders”. The recent world crisis had its major origins in speculative initiatives by financial institutes, banks… and we all pay for it, while they are again making big profits and distributing shameful bonuses. The increased prices for rice, wheat … and other essential commodities is not only due to lack of these commodities, but I believe much more to speculative operators … again the financial ones. The politicians make some comments about this, but have no power to do anything …. and we all, if not easily accept, live with it. Banks seem today to be there for their own benefits, and the benefits of their owners and leaders, thus speculating rather than being there to provide capital for sound investments. Capital and speculation is overpaid, compared to labour. I was happy to see Obama arrive (anything was better than his predecessors), but knew that he would have a tough life. We all have a lot of admiration for the US in many respects, but at the same time, it’s so disappointing to see how many Americans, who should be generous and tolerant with the rest of the world, seem so conservative, believing that they are the only ones who know, that all countries should follow their model (if they at all bother)… How can Sarah Palin and consorts have such a success? When it comes to petrol, maybe we should know that the prices in US are two or three times lower than in Europe. In addition to the way of living in general, this is perhaps also an explanation to a comparatively too high consumption? It is so easy to pin your hopes on one thing, or one person, but it is (almost) always a failure. President Obama did, in fact, offer a lot of Hope for Change for those of us in the US. Many of us are equally frustrated, because he has thus far been unable to effect much change. However, putting the blame for this on him is not right. By the very nature of his job, he is only able to do one thing - sign and authorize something that BOTH houses of our Congress vote into law. He can't just wave his magic pen and lower prices, he can't just do anything unitarily - even if GWB thought HE could. The fact is, President Obama is a Constitutional scholar and has very carefully NOT done things unitarily, but gone the correct and legal route of following the intent of our Constitution. The founders of the U.S. did not want a dictatorship, or a King-dom. They wanted a country that answered to the people, and for many, many years our country DID do that. Unfortunately, due to Ronald Reagan, the Bush family and the Clintons, the U.S. has been taken over by big corporate business. A very FEW people own the court system, own the congress, and most likely own the CIA as well. In fact, it is said that the last President to fight against the CIA was John Kennedy - and we all know how well THAT worked out for him. In the past, the Indian people rose up and fought against the British oppressors. In Egypt this last week, the Egyptian people relatively peacefully rid themselves of some of their corrupt governing. When the revolution comes here, and it will, I do not think it will be bloodless. I do not think it will be pretty. I think it will be a horrible nightmare, because the greed of the Koch brothers and their Robber Baron cronies will purchase them the military and most other industries. Heaven help us all. Everywhere. When that happens. EEEEEEEEEE LETTY GIRL Sprots is a new god. i too googled 'sprots' but google corrected me as sports giving me more options to think, like sports authority, sports illustrated. sorry for the typo Lettys. You have kept your eyes and ears open and saw the whole picture. How i wished it was not true. The world is led by greed unfortunately. Are we all greedy ? What do you want in your life Peter ? Good health, a roof over the head and just enough to survive with a bit of ease. No more. i won't say comforts. In your case i would add knowledge as you give importance to knowledge Peter and you share it with us. When i am traveling in comfort, having a seat, my comfort is ruined when i see so many standing. i feel more comfortable when i give up my seat to any one older than me or a woman who is carrying a child. People stare at me as if i have gone mad. i can't apply the same for the rest of my life and i feel selfish when i see poverty misery and suffering all around me in India. And i wonder who is responsible for such misery in a world of abundance. It becomes my duty to inform my friends and make them aware that we are ruled by a few greedy individuals and not by the governments and elected leaders or self styled and manufactured dictators. But unfortunately my friends still refuse to believe me as they see nothing going wrong around them because my friends see poverty and misery as pure bad luck and laziness. President Obama was not in the news and no one heard of him until a few months before the elections. Nearly the whole world backed him. And he was all over the world the moment election results were announced. He was aware of the task and the expectations of the people of the world. i still believe that he is the man who would deliver. Or at least set the momentum to bring about a change. That has not happened so far in little over two years. Yes it is true that oil prices in the US are much lower than Europe and India. When the consumption in the US comes down i hope the prices will come down as well. High consumption, in other words slavery to oil, is encouraging the oil barons, the banks, wall street to get more greedy as the resources are dwindling fast. One day we will wake up to the fact that we have run out of resources. We have to remind them that they can't own the natural resources. they can't own water and air. It becomes the duty of a charismatic world leader to motivate the people to bring an end to tyranny. Dear SEW, yes, hopes keep us alive and going but they often crash. i have never seen such jubilation and euphoria over any election result in my life. Bringing about a change is a long term process. It will take hundreds of years to rectify the system which created rich and the poor. i am not accusing President Obama for failing to bring a change. He is aware of the responsibility thrust on his shoulders by the Nobel prize committee and the expectations of the people. He has to wade through the waters infested with crocodiles. He has to be friendly with them too. Bank-paper must be suppressed, and the circulating medium must be restored to the nation to whom it belongs." Now you see profit making private banks and private armies. Things have gone out of hand Sew. People are losing property, losing jobs. The middle class is disappearing and joining poor class. But who will motivate the people to fight. This is a people's fight like recent events in Egypt. i am also accusing the American people for being drunk, with what i don't know. The people have to fight the system and fight the corporate control and their private armies. As you have rightly said it is not going to be bloodless. A revolution is brewing in Iran now. Hope it is peaceful. A president misuses his power and plunges the country into an unjustified war for profit of big corporates. He comes into power with the majority of his party. And the president can control the inflation which may not be in the best interests of the corporates. Then President becomes another corporate stooge. President Obama should take initiative to make the Federal Reserve a government institution. He has the support of the people. A peaceful revolution is the answer Sew. President Obama has to tell the people 'Hey wake up' A change in US would bring a change in the world Sew. President Obama can do it. hey there. We are all feeling the food prices and gas prices.. they are like 3.26 a gallon here. And I heard food is suppose to jump like 25% or something like in the next six months some where i heard this. Rauf, there is always pain and suffering. I agree that it is a joke that Obama was awarded a Nobel Peace Prize. My country is a mess; people here suffer for it as do people all over the world, as you've made clear. Fear and helplessness and hopelessness overwhelm us all. We must not let it. Keep doing what you can, and you can do no more. Give your seat to the weary; share your onions with those who have none. Express your pain and your experiences so eloquently. Your voice is heard all over the world. It's better to light a single candle than to curse the darkness. Of course, we are doing both, eh? Lighting and cursing. Fine. It gives me hope! Love to you! Thanks for your visiting on my blog and nice comment! This Brazilian raptors hunt snakes too. Times ago I see a Crested Caracara with a snake in his claws. Suddenly he drops the snake to the ground... Just amazing. I really understand what you are saying. I am disappointed in many ways with Obama not acting more strongly to bring about the change that we hoped for. Realistically, many of the things simply are/were impossible without the American mindset changing completely. I think Obama is doing the best he can given the constraints he is working under.As my old Dad used to say: America is the land of the almighty dollar! Yes, Americans use far too much oil and they want it to be cheap --which it shouldn't be. Many Americans are horribly WASTEFUL. Thomas Friedman of the NY TIMES writes constantly on this topic. No one listens! Our so called healthcare system is AWFUL. Just got back from Morocco where changes are afoot. Please please do not be too too sad, dear Rauf. The world has always been a horribly difficult place. One of the problems I think is the “culture” here which is very materially minded – the almighty dollar has always been king (de Tocqueville mentioned it when he came) and their disinterest for the rest of the world has always been high. Many in the US try to help the disadvantaged but the majority has other priorities. The DOD (Dept of Defense) is the major consumer of oil. As of 2007 they were using as much as 340,000 barrels (14 million gallons) per day (greater than the consumption of Switzerland and Sweden.) Now in 2011 it must be even more. The US has too many foreign bases (around 760 in foreign sites) – if they would close half of them that would help their deficit but the military industrial complex is too powerful. To fret about it and make yourself sick won’t change much but it must be very depressing seeing what you see in your country. I feel for you and for them and understand your frustration. I am not sure it will change soon. Well, this president is doing very little for this country as well. I doubt anyone can figure out what his problem is. He cant possibly be that stupid. With so many cuts in all basic areas of life, its surprising to see where the money is actually going. And these recent and current wars are making some people rich. They are not going to end anytime soon. Sorry my friends i was keeping quiet pretending things are alright. But they are not. i was wondering what is the point in writing about it. Still thinking. Don't have a clue. TWEETEY, sorry i took so long to respond to your comment. Will things get alright by keeping quiet hoping for a better tomorrow ? i don't see any hope. We are getting deeper and deeper in to a trap. A trap of money. There are two ways to keep the nose above water. Work harder or longer hours or borrow. Why do we have to do it in a land of abundance ? We are blessed with a giving earth. And it is free. We are now paying for water. Hope we don't have to pay for air to breathe. JULENA, i am hesitating to write as it hurts me and the reader. i have been delaying responding to comments in hopes of things turning out well. This is not happening. Life itself is not a pleasant journey Julena. We are trapped here without any options. We do our best to make life enjoyable but survival has not been easy for many for thousands of years. Believe me Julena our survival should be easy in a land of plenty. Even after 4.5 billion years our planet, mother earth is still giving in abundance, thankfully. Mother earth can feed twice the current world population. There is no room for poverty suffering and hunger. What has gone wrong Julena ? There have been very smart humans, they are in a minority, very very few. Rest are us, not so smart humans. i would expect the king or the ruler to treat all his subjects equally. How he became a king or who made him the king, is a different matter. Those in command have not treated people equally. i am accusing President Obama for the same. He has been helping the rich become richer ignoring the plight of the common people. This is not new Julena. Sometimes i hope that things would get better. But history shows that there is no hope for the poor. they would continue to suffer. President Obama can start the change he promised. But so far none forthcoming. We have been cheated and lied to for thousands of years. Same lies are continuing in different forms. Myths have been sold to us in the past to prevent us from thinking. Now fear is being sold wrapped in new myths to keep the common man from revolting. hope you are doing fine Julena. Dear SONIA, oh yes, that is amazing. Snakes are still alive when captured, they die when dropped from a height. The raptors do the same with tortoise too. They drop them on hard surfaces like rocks. Here's an interesting story Sonia. According to legend, eagles picked up tortoises and attempt to crack them open by dropping them on rocks. An eagle mistook Aeschylus' head for a rock (he was bald) and dropped it on him instead. Thanks for your comment on my current post. I agree with you, the photographer must have much talent and patience to take photos in that epoch! oh ! dear ELIZABETH, you are so sweet. i am fine, please don't worry. Sad at times but i am OK. Being in India it is difficult to remain insulated and insensitive to the surroundings. Misery hits you where ever you turn your face. You have traveled in India Elizabeth and you must be having a good idea how miserable things are over here. Even if one remains in a bubble, its bound to get pricked sooner or later. i travel a lot, often by public transport, with poor people, sometimes with basic comforts. i do not go looking for misery and suffering. Its there all around us and you can't avoid seeing and experiencing it. Misery is very cleverly designed and crafted in India. It did not happen by chance. There is a long history behind it. The society is divided into four castes, Exceptionally smart and very timid, Strong brave and dumb, clever and rich, lowest are dumb dumber and dumbest, who form a majority in India, They are untouchables and untouchability is religion. They are born into misery. They have no hopes. So why am i connecting this to President Obama ? He had nothing to do with caste system in India. benefits to the low caste people. They are often misused than used. Globalisation brought more misery to the suffering, specially to the farmer community which has nothing to do with Hindu religion or the caste system. Globalisation was a global disaster. Perhaps it helped the rich and the very rich. Bill Clinton and GWB made it worse. Then came President Obama. He brought hope. He promised a change. Change is not possible in a short period. But there are no proposals, no ideas forth coming Elizabeth. US is a giant and it can crush any nation. What ever happens in the US affects all of us, like the financial disaster. The European Nations got together and implemented Bank regulations after the disaster. Something opposite happened in the US. President Obama appointed the same people who caused the disaster and opposed regulations. This indeed is very funny for a man who made loud promises Elizabeth. Dear Elizabeth, thank you so much for your contribution to this debate with your valuable insights on the problems facing us. VAGABONDE, I sincerely apologise for my late response to your contribution to this controversial post. i am not consciously making myself sick. Misery in India has been around for thousands of years. The misery regarded as religion as i have explained to Elizabeth in the comment above. Some how in the past, the people, mostly the untouchables, entertained some hope for their younger generation, even though they were denied the rights to hope and dream. They survived through misery. Mass suicides are recent occurences, ever since the arms of Indian administration were twisted to accept globalisation. Seeing absolutely no hopes, the entire family would commit suicide. This tragedy was spreading like an epidemic. Never before the globalisation, such mass suicides have taken place in India. The authorities and the press, largely owned by the corporates would never disclose the actual figures which are four to six times higher than the figures officially reported. These mass suicides are the direct result of the globalisation. Now you can understand why i feel sick of everything. The unfortunate people who commit suicides with wife and children are not aware of the actual causes. They do not know that there is a place called America. They do not know which corporate is depriving them of their livelihood. They do not know who Clinton Bush and Obama are. They die without knowing. The reasons are simple for them. They cannot repay loans, their lands taken away from them, no work and no food. Why ? They do not know. They do not know. They just commit suicide. The entire family is lying dead. This is not a hot and spicy news. No one cares to report. VAGABONDE, as you have rightly pointed out, the dollar seems to be the king. Everybody seems to be after the mighty dollar, specially the third world countries. There is excessive plundering in the countries blessed with natural wealth. All to get the mighty dollar, grossly unaware that they are chopping their own legs to meet the demand for the raw material for the comfort and luxury of the rich. This is total mismanagement of natural resources, which have gone into wrong hands. The demands come from the powerful nations. To meet the demand, sanctioned by the greedy and corrupt politicians, the contractors often employ underpaid child labour with deplorable working conditions. Meeting the demand for comfort and luxury will cost the third world dearly. The cream of organic food produce is always exported to rich countries making it unavailable to the locals like me. Even if it is available, i cannot afford to pay the value of the dollar. This is bad management. As you have rightly said, it is the problem of the materially minded culture. i tried to make the same point in older posts. It is difficult to sacrifice comforts but there is no will to bring about a change unless we actually face the threat of drying up our resources. We are under some delusion that mother earth would go on giving for ever. One day it will stop giving. And there is threat of war among the smaller nations who would kill each other to meet the demand of the mighty to earn dollars. Who should take steps to stop the plundering Vagabond ? We have the man in power who can do it. Is he taking any such steps ? Thank you so much for your contribution Vagabonde. You have made me think and made me aware of some very vital issues bothering the human race. hope you are doing fine Vagabonde. Thank you for answering my comment Rauf. It is very difficult to see what is happening in the world and not feel powerless and depressed. But then I am sure that people centuries ago felt the same way and somehow we have survived. But it is tragic - for example right now the offensive in Libya conducted by France the UK and the US – they say it is a “humanitarian” gesture. I think this is a “selective” humanitarian interest. Where were they and the UN went Israel bombed Gaza in 2008 and killed 1,300 people - how about the problem in Rwanda with the Tutsi where about 1 million died? About the Congo which has been in a terrible war, massacring civilians – about 5 millions so far? And the Sudan – what 3 millions maybe? Or Burma killing many Buddhist monks? Let’s not talk about North Korean civilians dying of starvation – don’t they need a “humanitarian” help? Well you will say, their land is not located on oil fields – and that is why so many countries call us hypocrite, and they are right. Thank you Rauf, I am fine and my cold is getting better. I just wanted you to know I moved my blog to www.nixmix2011.blogspot.com . hope all is well..
"I became insane with long intervals of horrible sanity." joke : "doctor, can you give me a prescription or something that'll get me exited about the olympics ?" Or have you run away from home? Just stopping by to say hello and wishing you a pleasant Sunday. Thank you Rauf for your visiting and gentle comment on my post "Clump of Trees". I agree with you, it is a perfect place to sit and meditate, compose music or poetry. Really an inspiring atmosphere. no more smiles!no more posts too??? Just dropping by to say hello! Hope you're okay. a wee bit concerned... as you have not posted in quite some time.... i hope all is well with you. the kids are great, i know you will wonder. .... but im still wondering if you are ok sir??? Happy birthday, dear rauf. Wishing you many happy returns of the day and many more years of amazing blogging. Rauf, The world is in a sorry state of affairs.. and every day it makes me sad.